The DirectFeedthrough property will be removed in a future release. Delete all instances of this property in your MATLAB® code. For more details, see Compatibility Considerations. The dsp.VariableIntegerDelay System object™ delays input by time-varying integer number of sample periods. Create the dsp.VariableIntegerDelay object and set its properties. vid = dsp.VariableIntegerDelay returns a variable integer delay System object, vid, that delays discrete-time input by a time-varying integer number of sample periods. vid = dsp.VariableIntegerDelay(Name,Value) returns a variable integer delay System object with each specified property set to the specified value. Specify the maximum delay the object can produce for any sample. The object clips input delay values greater than the MaximumDelay to the MaximumDelay. Specify the values with which the object's memory is initialized. The dimensions of this property can vary depending on whether you want fixed or time-varying initial conditions. To specify fixed initial conditions, set the InitialConditions property to a scalar value. The object initializes every sample of every channel in memory using the value you specify. To specify different time-varying initial conditions for each channel, set the InitialConditions property to an array of size 1-by-N-by-D, where D is the value of the MaximumDelay property. When you set this property to true, the object allows direct feedthrough. When you set this property to false, the object increases the minimum possible delay by one. Data input, specified as a vector or matrix. This object supports variable-size input signal. That is, you can change the input frame size (number of rows) even after calling the algorithm. However, the number of channels (number of columns) must remain constant. Delay input, specified as a scalar, vector, or matrix. The delay is an integer value. Vector –– The length and the orientation of the delay vector match the length and the orientation of the data input. Column vector –– The length of the vector is M.
Row vector –– The length of the vector is N.
Matrix –– Delay must be an M-by-N matrix. The dimensions of the delay signal can change according to the supported dimensions listed in the table. The table also shows how delay signal is applied to the input signal. M-by-N (N channels with frame size equal to M) M-by-1 M-by-N Delay value varies within the frame from sample to sample. Same set of delay values for all channels. Delayed output, returned as a vector or matrix. The size, data type, and complexity of the output match the size, data type, and complexity of the data input, input. 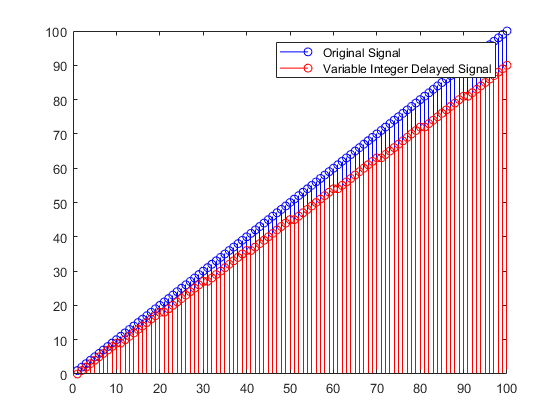 Delay a signal by a varying number of integer sample periods. When you set the DirectFeedthrough property of the System object to true, the object allows direct feedthrough. This behavior is different from the way the block behaves when you select the corresponding Disable direct feedthrough by increasing minimum possible delay by one check box on the block dialog. When you enable this block parameter, the block does not allow direct feedthrough. The DirectFeedthrough property will be removed in a future release. Trying to modify this property warns. Make sure you remove all references to this property from your MATLAB code. The dsp.VariableIntegerDelay object now operates in direct feedthrough mode by default.